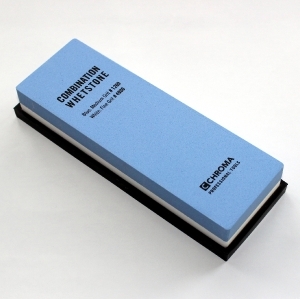 Chroma ST 1200/4000 Combination whetstone is for medium grit sharpening and the higher grit for final polishing. Our knives are made from exceptional steel and the vast majority of them have the typical Japanese “V” edge. This edge makes our knives sharper than many conventional kitchen knives. But even the sharpest knife at some point begins to lose its edge and needs re-sharpening. Sharpen your high quality knives by hand with a top of the line original CHROMA sharpening stone. For best sharpening results, we recommend using a rougher grain to pre-sharpen, a medium grain for regular care, and up to the finest grain for a polished finish. We also recommend the Sharpening Tutorial DVD for manual sharpening, available at CHROMA knife. Be sure to take note of our particular sharpening stone recommendations for each different knife series. Better to buy one knife less, and spend your money on a good sharpening stone instead! Tip: Never allow your knives to become entirely dull, always sharpen them before they reach that point! Our knives are manufactured in the best factories and are made of the finest and strongest modern high-grade steel from Japan. Knives by Chroma Cutlery are extremely sharp and hold their edge for a very long time.